Holidays in a foreign country feel different. No matter how hard you try, it’s just not quite the same as in your country of origin-- but that’s not necessarily a bad thing. We had a pretty wonderful Easter, along with the days surrounding it. On Good Friday we took a group of interns from El Refugio to Midad Del Mundo-- the monument recognizing the actual equator line that runs through Ecuador. It’s about an 8 minute drive from Calacalí. We took pictures standing on the yellow line, ate Fanesca (the typical soup eaten here during Holy Week), and watched a processional/parade of Ecuadorians in Holy Week garb. 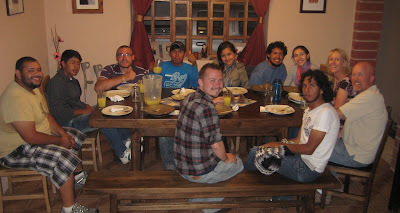 That night we also had a group over to our house and ate together, talked for a while, and watched a movie. Saturday was a slower day spent at home preparing for Sunday. On Sunday we had a sunrise service on El Refugio’s property. We learned that occasionally in the past this had taken place, so Suzy took it upon herself to invite, organize, and plan this year’s service. We drove up to a great look-out point at 6:30am. This is what it looked like shortly after we got up there. We had a mix of readings, sharing, and worship through song. After the service we drove back down to El Refugio’s dining area and had a good-ol’ breakfast potluck. 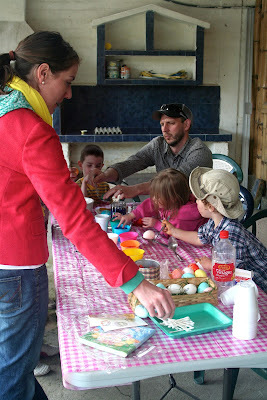 Mid-morning we transitioned over to our house and had an easter-egg hunt, painted eggs, and had another delicious meal prepared by Suzy. People hung around into the afternoon and we were blessed with a sunny, beautiful day to be in fellowship with one another. So. Holidays do ‘feel’ different in different locations... but being surrounded by other believers who are celebrating for the same reason we are makes it feel just like it should. This is just beautiful! I love reading about how you've made your home right where God planted you, seeing your new traditions, and your adventures in Ecuador. We miss you guys, but know you're right where you belong. We're praying for you!